Sweet, little Heidi came to MSRNT as a stray from way out in Hood County. Suspected to be about 9 years old, Heidi experienced a hard life without an owner to love and care for her. She currently weighs about 15 pounds, but her healthy weight should be about 22 pounds. 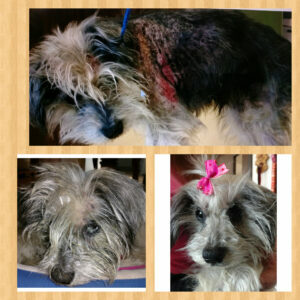 Poor Heidi came to MSRNT emaciated, with significant hair loss due to poor nutrition and sores on her skin. She was diagnosed with anemia and Keratoconjunctivitis sicca (KCS), otherwise known as dry eye, which has left her partially blind. KCS is characterized by a dog’s tear ducts drying up and failing to properly moisten the cornea. Unfortunately, once the illness starts, it is most likely irreversible. MSRNT is currently treating Heidi’s KCS and anemia, as well as working on her nutrition to get her weight up to what it should be. 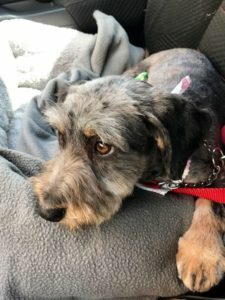 Heidi has a long road ahead of her, but MSRNT is committed to seeing this adorable, little girl heal and eventually thrive in a happy and loving new home. Please consider donating to help treat Heidi’s hurting body. With the help of generous donations, MSRNT looks forward to seeing Heidi experience a new world of love, health and happiness. 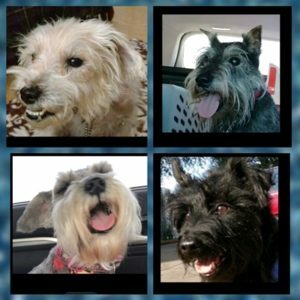 Schnauzers need is a professional dental cleaning by your vet. This is not a cosmetic issue, but one that can seriously affect your dog’s health. Thanks for your help—and remember to take care of your own dog’s teeth! Bergen was a country boy when he came to MSRNT. He was a field dog that bore all the skin conditions a dog with allergies would have if living in a field. When MSRNT took him, his skin looked like an elephant’s, cracked and crusty with scarred and open sores and a huge flea problem. He had patches of hair missing, and he was also diagnosed with a pretty bad ear infection. MSRNT immediately put him on antibiotics, topical creams and bathed him with medicated shampoo to heal the sores and start sloughing off the dry skin. Soon, Bergen’s skin turned new and pink, and peach fuzz signified new hair growth. While Bergen is doing better, MSRNT is still dealing with the costs of treating his skin. Bergen will be taken back to the vet in the next few weeks to have a check-up on his ear and see how his new skin is coming along. Please consider donating to help MSRNT recoup the costs of Bergen’s treatment. This happy, loving boy is on the road to recovery and will soon meet his new, forever family thanks to all of our generous donors. MSRNT does everything possible to get our dogs in top shape prior to adoption. Although sweet Bridget is longing for her forever home, she first must undergo surgery to treat her ‘cherry eye’ condition. This condition is the prolapse of the third eyelid, which helps protect her eye. This eyelid contains a tear gland that promotes oxygen supply and is responsible for a portion of the tear production of the eye. When working properly, the third eyelid is tucked away and can’t be seen. When the anchoring tissue is not working correctly, this third eyelid can protrude, producing a very red lump in the inside corner of the eye. While it’s not usually painful for dogs, this eyelid helps protect the eye, and MSRNT wants to ensure its health. 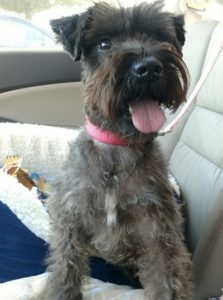 Bridget’s recovery time will be about six weeks, after which this sweet girl will be ready for adoption. 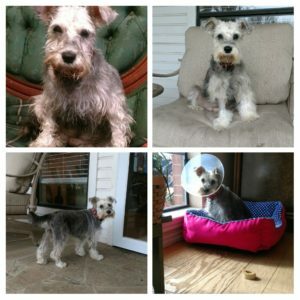 Can you help MSRNT cover the expenses of Bridget’s eye surgery? These two dogs were surrendered to MSRNT after they were attacked by other dogs, and because their family could not afford the veterinary care that they needed, they went several days without treatment. MSRNT stepped in to rescue the dogs, and immediately provided medical care, which included the treatment of complex puncture wounds, and surgery to repair a hernia that resulted from the attack. 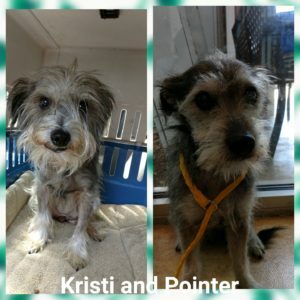 Kristi and Pointer are now on the mend, but are scared and will need to be re-socialized and regain trust in humans. MSRNT is providing great care, but can you help us with their medical expenses? We would be most appreciative. Hope was rescued from a horrific cruelty situation, where her two back legs had been removed non-surgically just below the knees some time ago–presumably by her owner–who was found and is now facing animal cruelty charges. Hope weighs about 13 pounds, and has blossomed in foster care. She loves everyone she meets. In her foster home, this gentle soul is learning about love, kindness, and exceptional care. She is very friendly and loves other dogs, and is great with cats and older kids. Despite her handicap, Hope still manages to get around quite well and is a healthy girl—estimated to be about 8 months old. She has been spayed, and MSRNT is now working to enhance her mobility. 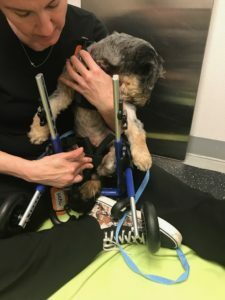 She is beginning regular physical therapy that will help her learn to walk with assistance from a special harness that supports her hind end, and relieves pressure on her back. This will help her transition to a custom wheelchair/cart device. Once she stops growing, she can be evaluated for a prosthetic leg. If you would like to show your support for this precious girl by helping us financially with her physical therapy and related costs—or if you are the right family that can commit to giving this angel a forever home—PLEASE donate or fill out an adoption application for her. This is an exceptionally sweet girl, who shows love and affection, and deserves a lifetime of love and kindness. Sometimes a dog’s story is so horrific and sickening that it’s hard to share, but a dog we’ve named Hope now has a second chance for the life she deserves thanks to MSRNT. This one-two year old girl had been dumped by her owner and then picked up by animal control in the middle of a road. They determined that her two back legs had been removed non-surgically just below the knees some time ago–presumably by her owner–who was found and is now facing animal cruelty charges. Hope’s legs have healed, and despite the unimaginable brutality, she is a sweet dog who still manages to get around with her handicap. The vet says she is healthy, and she will soon be spayed. We will work on how to help enhance her mobility, and in the meantime she is being shown kindness and lots of love in a foster home, where she is already responding and learning to trust. If you would like to show your support for this precious girl by helping us financially—or if you are interested in giving this angel a forever home—PLEASE donate or fill out an adoption application for her. We’re happy to report that over the past few months Ryker has been slowly but steadily recovering from the very rough condition he was in when MSRNT rescued him. His wounds have healed, and his progress and recovery from a complicated surgery to save his front leg is pleasing his doctors. He continues to have regular re-checks on his leg at the vet, and the great news is that by early-mid June he should be fully recovered and ready to go to his forever home. 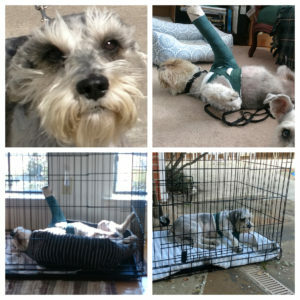 Unfortunately, the first part of his recovery was dependent upon being immobile as possible, but he’s now able to be up and around, bearing more and more weight on his leg. He is now off pain meds and is happy to be on the move–but even when he was enduring pain and discomfort, his sweet disposition was still intact. He has charmed his foster Mom, and the few others he has met. 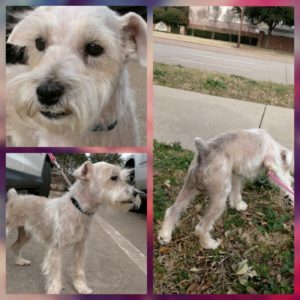 In the coming weeks, he’ll be ready to attend adoption events and show off his great personality and Schnauzer good looks, and start dropping the few extra pounds he put on while laying low in his crate. We look forward to having everyone meet Ryker, and are anxious to learn which lucky family will be bringing Ryker to his forever home. A huge thanks to all who have supported, and continue to contribute to Ryker’s medical needs! Ryker has had a tough road, but we’re so grateful to have rescued him. He arrived with a front leg dangling, multiple lacerations, scrotum burns and a broken tooth. He took a hard hit from an unknown source, and even though he was in great pain, he wagged his tail as we took him to emergency treatment. 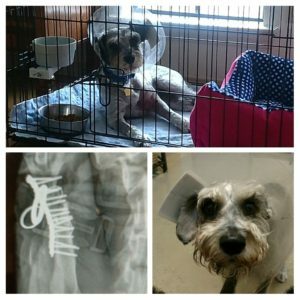 Ryker underwent a complicated surgery to repair his front leg, and he was neutered. He now requires kennel rest for 4-6 weeks, and then must be treated for heartworms. The great news is that he is a super sweet boy, even while dealing with painful injuries. He has a long road of recovery and treatment ahead, and we could really use some help with his medical expenses. His initial care cost more than $2,600, and we expect to spend another $1,000 for the remaining care needed. Can you help this sweet boy recover, and get ready to meet his forever family? We’re so excited about how our sweet Dena has progressed. Her cataract surgery was a success, and she is healing nicely. 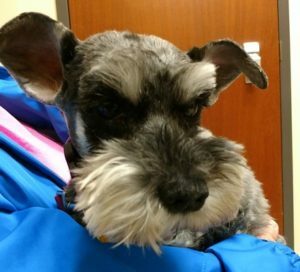 Of course, now that she can see, her personality is blossoming, and she is enjoying the favorite Schnauzer activities of watching out the window, chasing squirrels and playing. After she is fully healed, she will be ready for a forever family, where she will know a lifetime of love. We cannot say thank you enough to everyone who was so generous in donating to MSRNT to pay for her surgery. Your generous gifts were a tremendous blessing to this special girl. Dena is a very sweet girl, about 8 years old, who was surrendered to MSRNT because she was blind. She has cataracts, which have slowed her down a bit, so she moves slowly through her foster home so she doesn’t hit doors or walls too hard. She has been evaluated by a specialist, and the good news is that she’s a very good candidate for cataract surgery! What a difference being able to see will make for this little girl. Her foster Mom says she is a sweetheart, who is easy to have around the house. At a recent adoption event, she cuddled up on a lap and enjoyed being petted. She has had several litters of puppies before, but she’s now been spayed and is looking forward to a life where she can be a beloved family pet instead of a puppy maker. Cataract surgery is expensive — $4,000 for both eyes. Can you help MSRNT give this little angel a new life where she can see her new world with a family who will cherish her? Aldo is a sweet, happy and playful 3-year-old boy that came to MSRNT with a broken leg. He runs around using just three of his legs, holding up one of his rear legs. 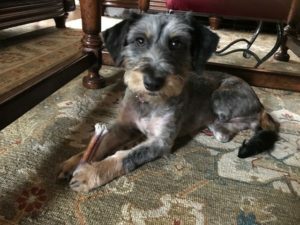 Our vet believes that due to the nature of the break, and the amount of scar tissue and muscle loss, that it cannot successfully be repaired surgically, and recommends amputation. While we would love to save his leg, it is not feasible, so we will proceed with the amputation of one of his rear legs in early January. Within about a month, this sweet, lovable boy will be ready for his forever home. Can you help MSRNT with Aldo’s surgical and medical expenses?